In this quiz, you’ll step into the shoes of 87-year-old Mr. Joseph. You were young when you last explored the Estuary’s shores and now your memory isn’t so good anymore. 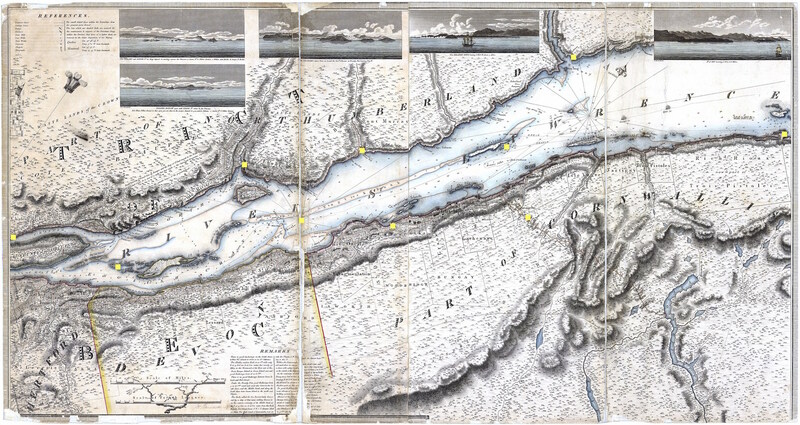 Explore the 1815 map to refresh your memory. Answer the 10 questions to see if you’re on the right track. When you’re ready, go to Question 1. You can check the map at any time. You can zoom in and move around to access the informative capsules. But careful now! The answers may be found in the capsules, directly on the map or in the Testing the Icy Waters section. You’ll find out that working with archival documents is rewarding, but not always easy! Consult the information capsules to find the right answer! At your own risk River, to the south of L'Isle-aux-Coudres and to the northwest of "Riv Ouelle"
Joseph Bouchette. Topographical Map of the Province of Lower Canada Showing its Division into Districts, Counties, Seigniories & Townships, With All the Lands Reserved Both for the Crown & the Clergy , 1815, Bibliothèque et archives nationales du Québec, G/3450/1815/B68 CAR pl.